We flew to Dubai on Emirates an airline I can highly recommend. Flying economy for 6 hours was very comfortable. I pre ordered a gluten free inflight meal. Because I have additional food intolerances it makes eating on planes quite tricky. Yeast (wine, vinegar soy sauce etc ) and onions are not things you can avoid with inflight meals, sadly. The likelihood was that there would be very little I could eat. With this in mind we grabbed breakfast at Rhubarb at terminal 3 Heathrow. 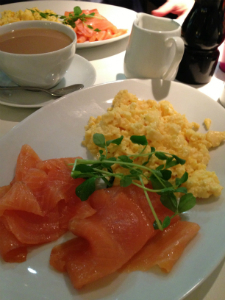 A huge plate of smoked salmon and scrambled eggs was just the ticket. The 6 hr flight went very fast, helped by a great selection of up to date movies. 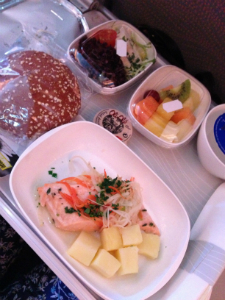 The gluten free meal offered was simply cooked salmon with a few tiny squares of potato, I was very grateful for this. 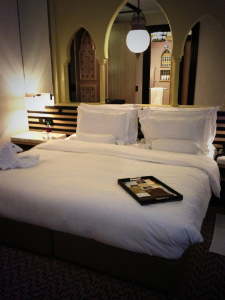 We stayed at the Mina A’Salam part of the Jumeirah resort in Dubai, a grand boutique hotel. 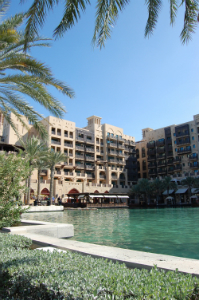 The hotel is built in the traditional arabian style with waterways, souk and spa. During our stay we tried a selection of the restaurants in our hotel and the neighbouring hotels only a boat ride, walk or buggy ride away. 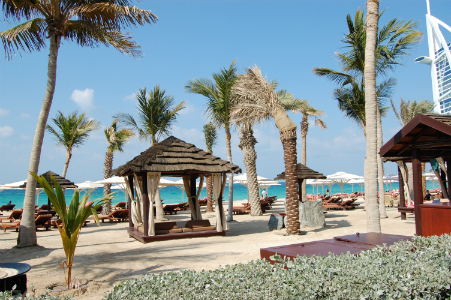 On our first night we had dinner at La Parrilla at Jumeirah beach hotel just a short buggy ride away, along the edge of the beach front. 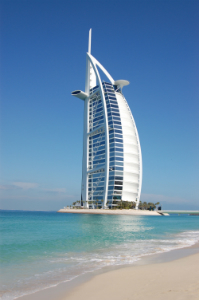 Infront of the hotel is the famous Burj al Arab the sail shaped all suite hotel. A stunning looking structure set on an island just off the beach. La Parrilla is an Argentinian restaurant located on the 25th floor of the hotel. After a cheeky Gin and Tonic we checked out the menu. Steak was an obvious choice, to have it with fries would be amazing but it was unlikely that I would be able to have it in the restaurant due to cross contamination. I passed my new business/intolerance card to the waitress and almost straight away the chef appeared asking how he could help. The argentinian chef went through the entire menu with me and gave me lots of alternatives for dinner. He offered to make me my own chips, fried separately. How could I refuse! 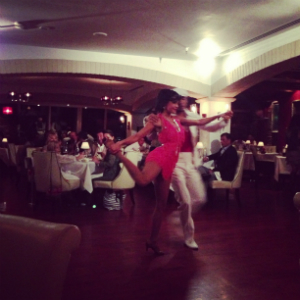 While we waited for our food we enjoyed spanish dancing and live music . 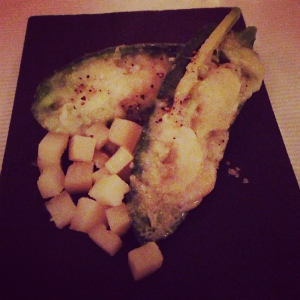 For a starter I decided on two small tapas dishes manchego cheese with honey and stuffed peppers with avocado and cheese, both stunning. Sadly the only option for pudding if you are gluten intolerant or Coeliac is fruit, I watched Mr S tuck into a delicious looking pudding. 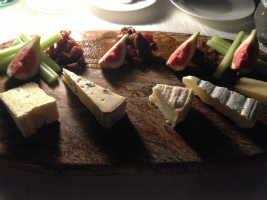 It would be good to see a gluten free option added to the menu or possibly a cheese board with celery and fig. Time to check out the breakfast buffet, fingers crossed! I wasn’t disappointed, separate stations for each type of food. Bread products right away from fresh fruit etc. Chef on hand to prepare eggs, no flour near by. A huge relief. 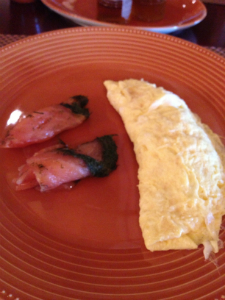 2 egg omelette and smoked salmon with fresh fruit to start. 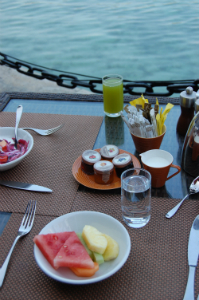 You can choose to eat inside or outside looking out towards the sea. Just watch out for the crows that like to fly down when you leave your table unattended. 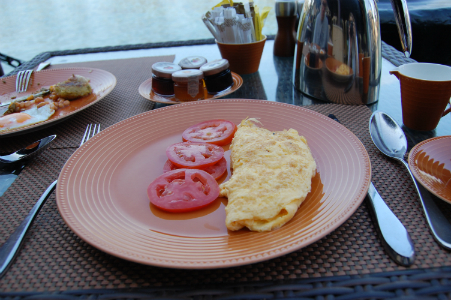 The safest choice for breakfast is definitely eggs with a choice of salmon , cheese or vegetables. Gluten free bread is available on request. 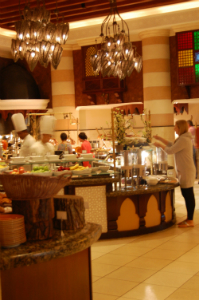 Dinner on the second evening was at Al Hambra in the Al Qasr hotel. 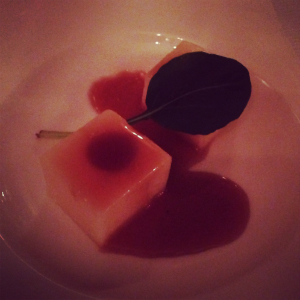 What the restaurant lacked in atmosphere it made up for with its friendly helpful staff. Straight away the chef came out to see us and went through the menu ticking suitable choices. 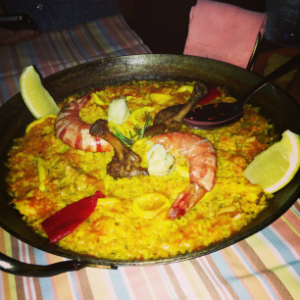 I was pleased to know that I could have paella. We started with tapas style garlic prawns and Serrano ham, followed by the paella it was a delicious meal and I would certainly return to this restaurant. 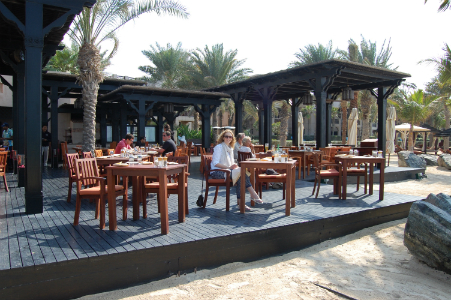 A good choice for lunch is Shimmers, a beach front restaurant with plenty of shade leading straight on to the sand. Once again after explaining to the waiter I had food intolerances the chef came straight out and we talked through what I could have. 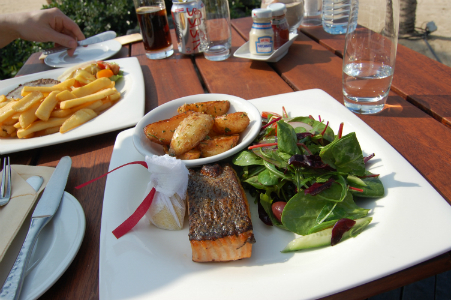 I chose Salmon with potato wedges cooked separately for me with a green salad. A pretty perfect setting for lunch! For our last evening in Dubai, a place which has totally surprised me and exceeded my expectations. We booked to eat dinner at Pierchic an extra special restaurant on a pier serving mainly seafood, dress code is smart elegant. 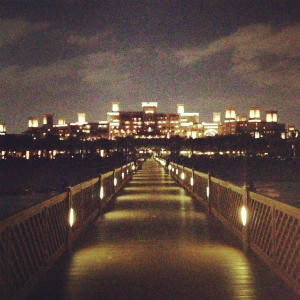 A view looking down the pier. Fortunately it was a still, warm evening perfect for sitting outside. We took a short walk to the pier where we were seated looking out at Burj al Arab lit up along with many other buildings on the shore line. A full moon adding to the already beautiful view. We had emailed the restaurant in advance and the chef came out straight away to talk through my intolerances. 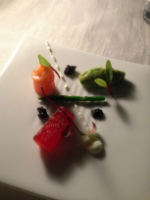 It turned out chef Rosalind Parsk came from Epsom very close to us in Surrey. 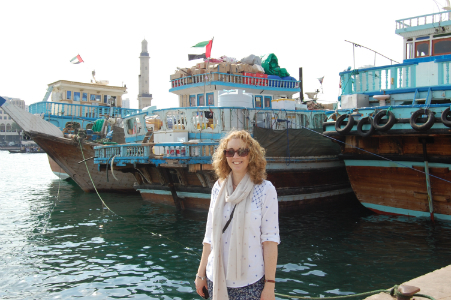 She told us she had worked for Gordon Ramsey and Gary Rhodes Grosvenor house Dubai. 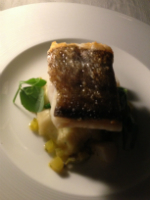 Chef Rosalind went through the menu with us and I decided to order scallops to start followed by Atlantic cod with mash and green beans. There was one small mistake with my main course some pickled caper berries fortunately I spotted them so it wasn’t an issue. I did let the chef know at the end, as she came out to check if we had enjoyed everything. I chose a cheese board for pudding as there was no option for a sweet dessert except fruit once again. Once again someone had added pickle to my cheese board, not to much of an issue but this does show how important it is to have good communication in the kitchens. 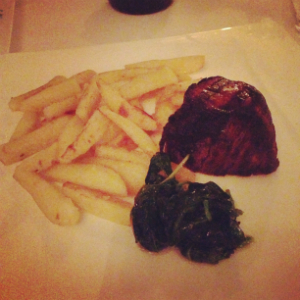 I would definitely eat at Pierchic again, a lovely location for a special meal. This sadly was only a short break on our way to Thailand, I could happily have stayed longer in Dubai. We visited the Burj al Khalifa, well worth a visit. The Dubai mall and the gold souk. 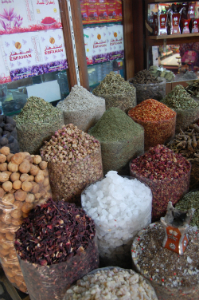 Top tip – if you stay half or full board at Mina a’ Salam, you may be given meal vouchers. It is worth checking which restaurants you can use your vouchers for. Some like Pierchic do not accept vouchers for Dinner. Other restaurants accept vouchers for both lunch and dinner. Email ahead to mention food intolerances too. They do take note and are much more prepared when you arrive. 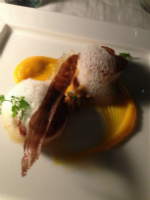 If there are restaurants you are keen to try it is worth booking in advance. 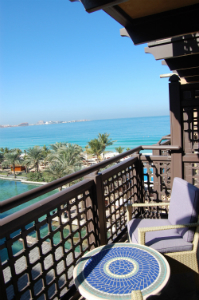 Whatever your food intolerance the hotels in the Jumeirah complex should be able to accommodate you. It appeared to me that they had a policy to send the chef out to make sure they can understand and cater for your needs. 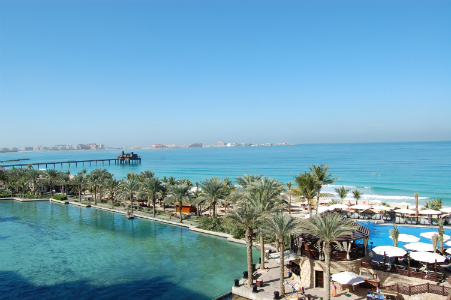 I’m sure we will return to Dubai and this hotel sometime in the future. Whilst not a cheap option, the fact that we could eat out so easily in a range of restaurants with no worries was worth a great deal. 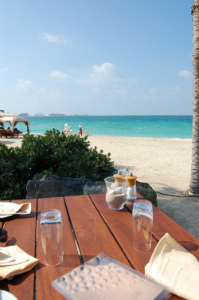 I would love to hear your experiences of eating out gluten free in Dubai.